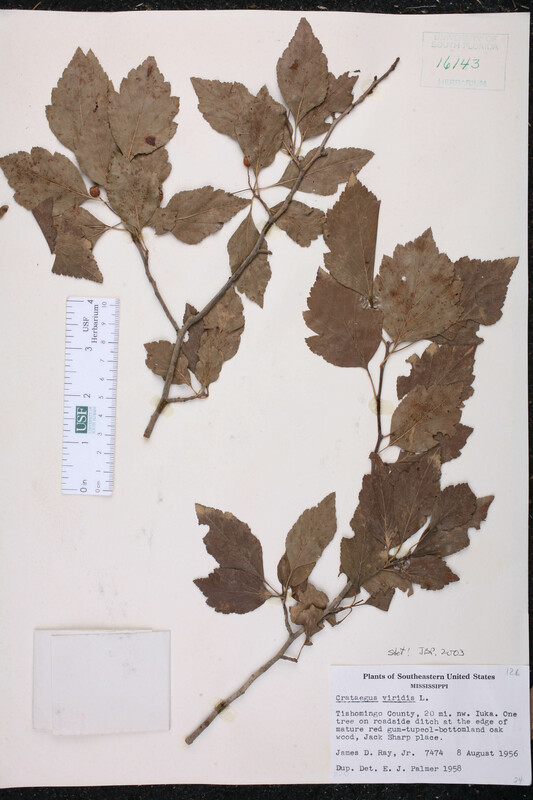 Citation CRATAEGUS VIRIDIS Linnaeus, Sp. Pl. 476. 1753. Type: TYPE: VIRGINIA: Without data, Clayton 526 (lectotype: BM). Lectoytpified by Eggleston, Rhodora 10: 83. 1908. 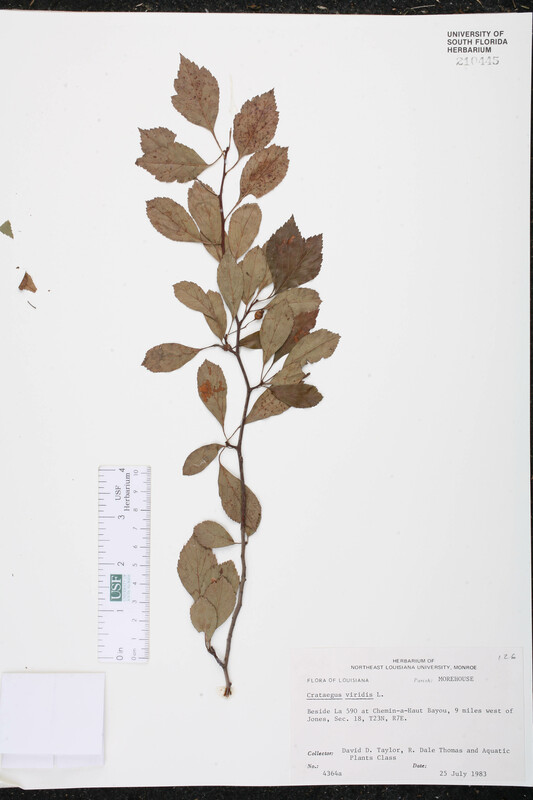 Crataegus coccinea var. 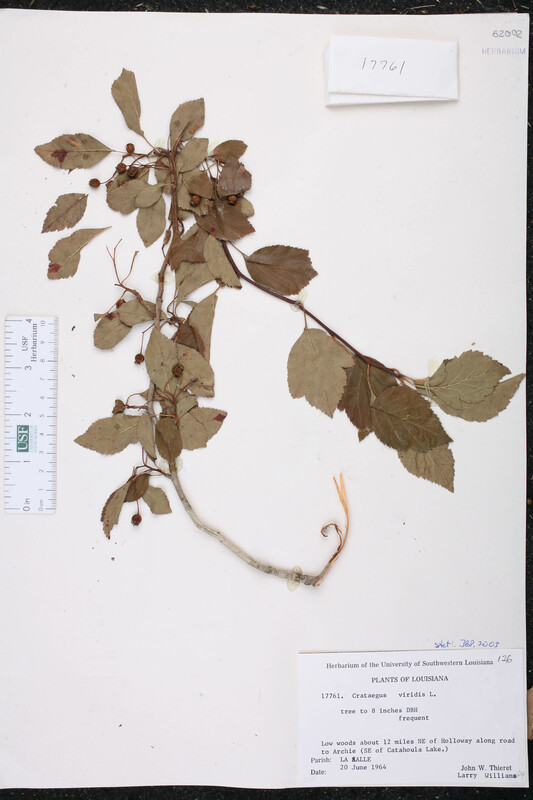 viridis Crataegus coccinea Linnaeus, var. 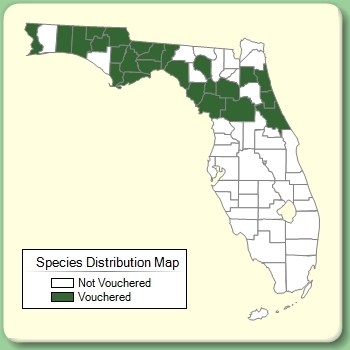 viridis (Linnaeus) Torrey & A. Gray, Fl. N. Amer. 1: 465. 1840. 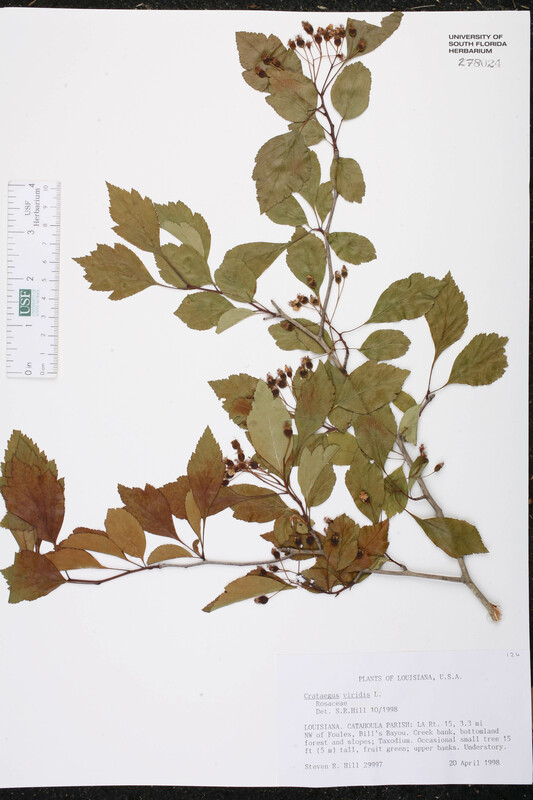 BASIONYM: Crataegus viridis Linnaeus 1753. 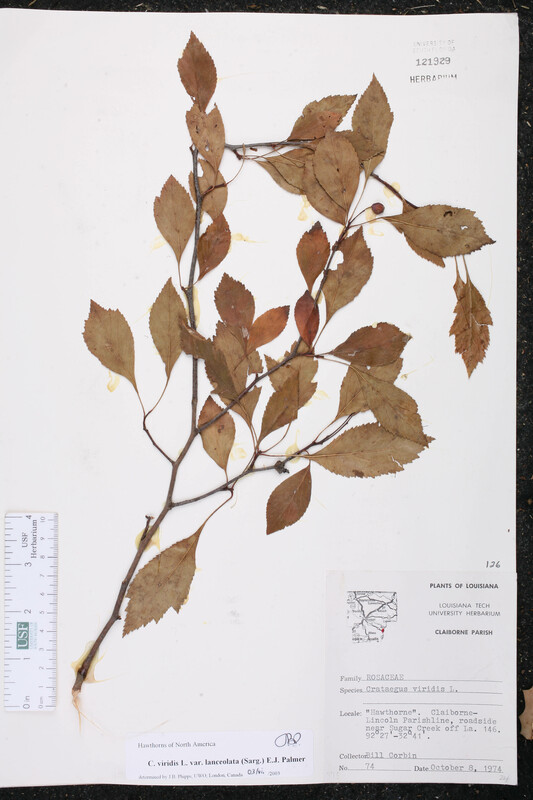 Crataegus lanceolata Crataegus lanceolata Sargent, Trees & Shrubs 2: 65, pl. 130. 1908. TYPE: MISSOURI: St. Louis Co.: Bottomlands of the Desperes River at Carondelet, South St. Louis, 6 May 1902, Kellogg 4 (lectotype: A). Lectotypified by J. B. Phipps et al., Harvard Pap. Bot. 11: 187. 2007. Crataegus newelliana Crataegus newelliana Murrill, Castanea 7: 24. 1942. TYPE: FLORIDA: Levy Co.: Vicinity of Gulf Hammock, 7 Apr 1940, Murrill 34609 (holotype: FLAS). 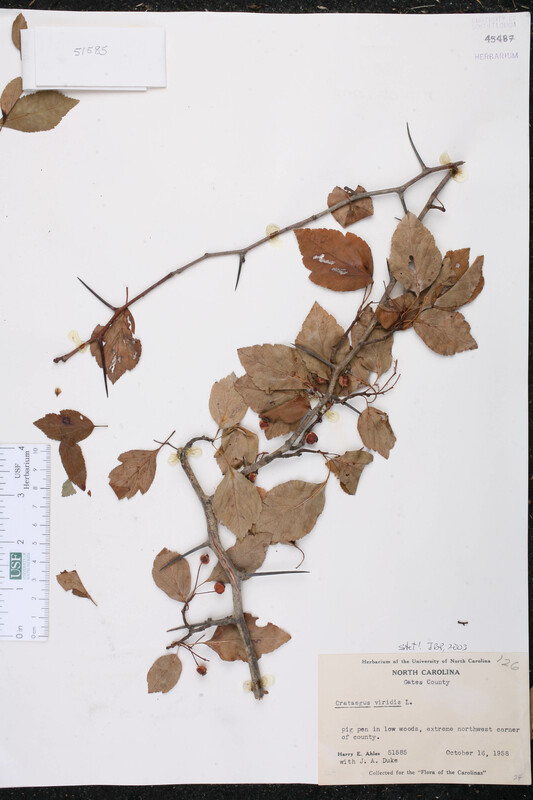 Crataegus paludosa Crataegus paludosa Sargent, Trees & Shrubs 1: 15, pl. 8. 1902. TYPE: FLORIDA: Volusia Co.: Haw Creek, 1 Aug 1900 & Mar & Sep 1901, Curtiss 6678 (holotype: A?). Crataegus subpaludosa Crataegus subpaludosa Murrill, Castanea 7: 28. 1942. TYPE: FLORIDA: Suwannee Co.: Margin of a small limesink near Hildreth, 10 Jul 1940, Murrill 34892 (holotype: FLAS). Crataegus viridis var. 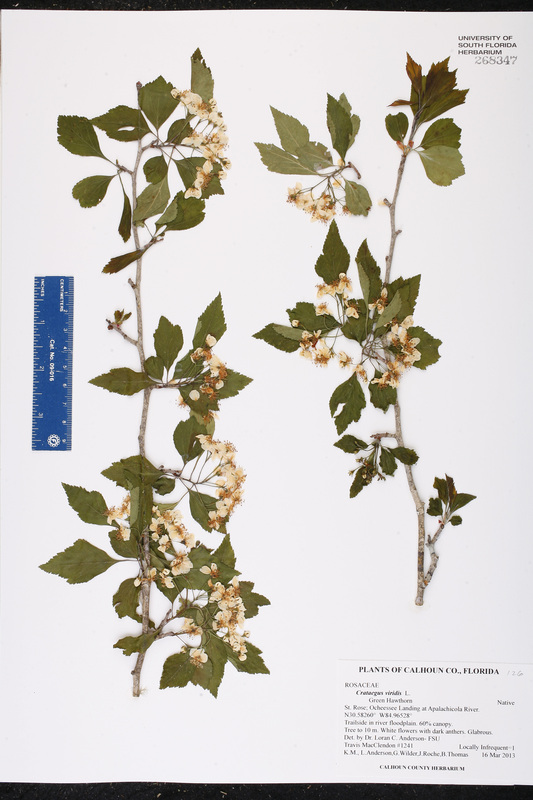 lanceolata Crataegus viridis Linnaeus, var. lanceolata (Sargent) E. J. Palmer, Ann. Missouri Bot. Gard. 22: 561. 1935. 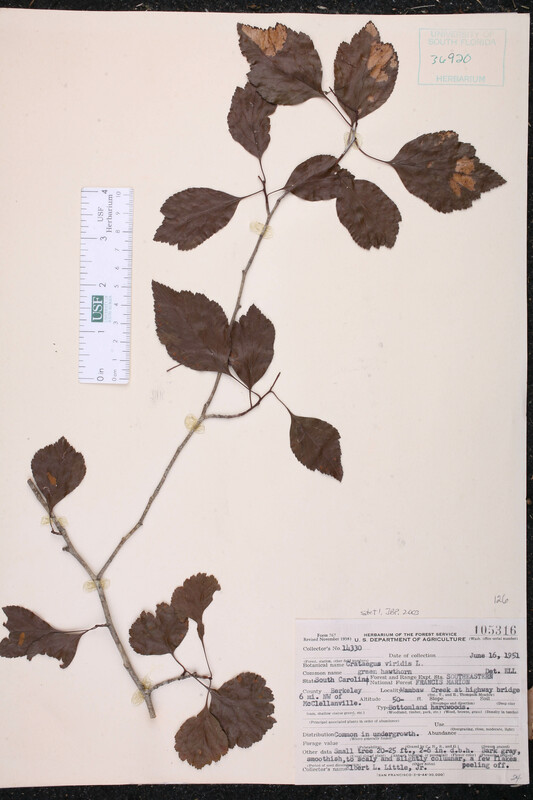 BASIONYM: Crataegus lanceolata Sargent 1908. 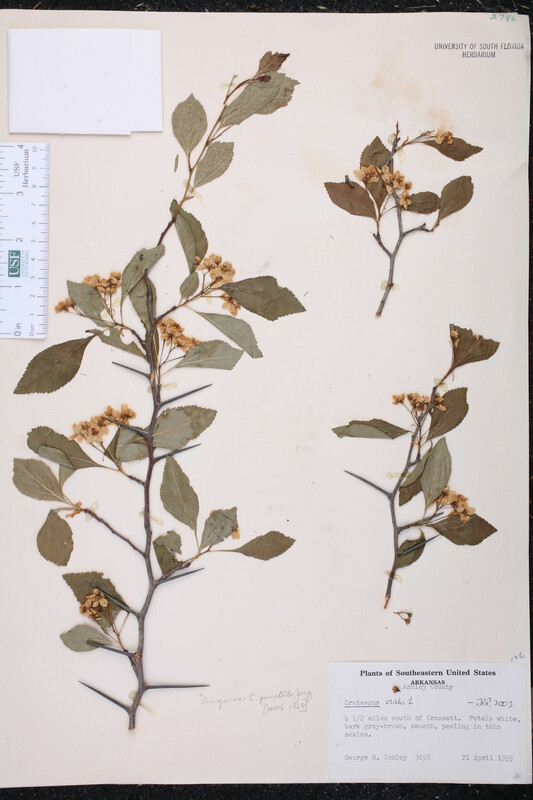 Mespilus coccinea var. 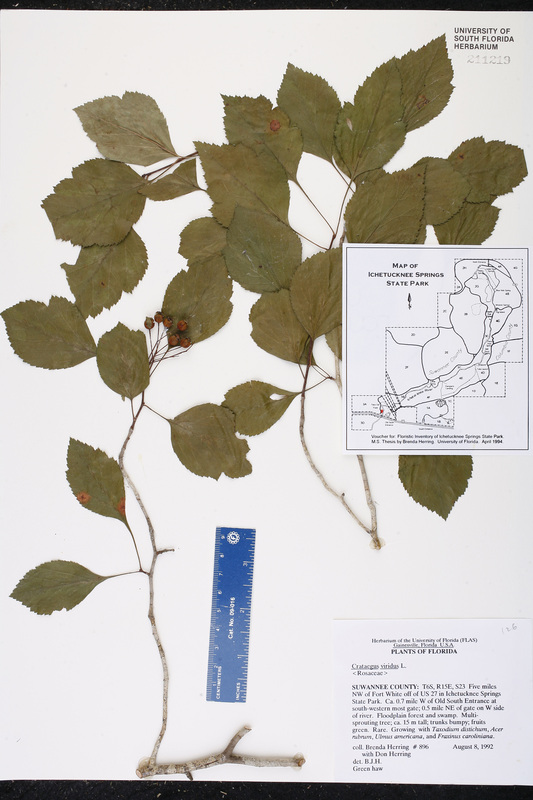 viridis Mespilus coccinea (Linnaeus) Marshall, var. 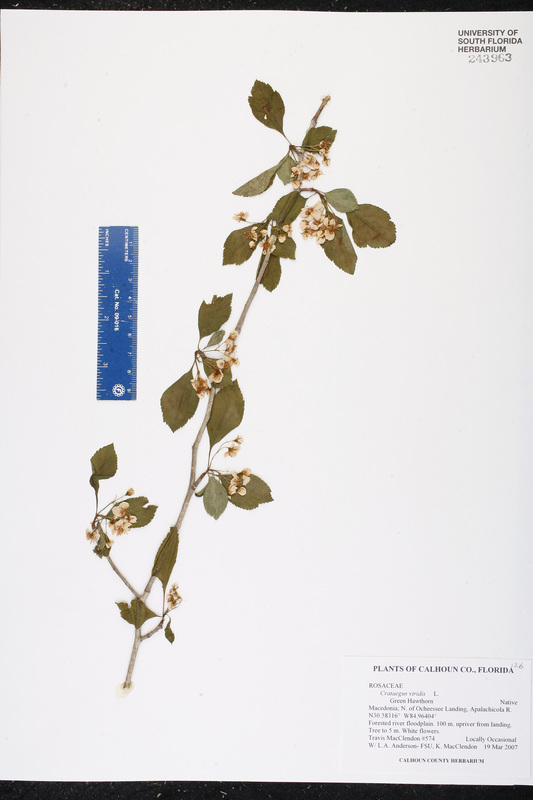 viridis (Linnaeus) Castiglioni, Viagg. Stati Uniti 2: 293. 1790. 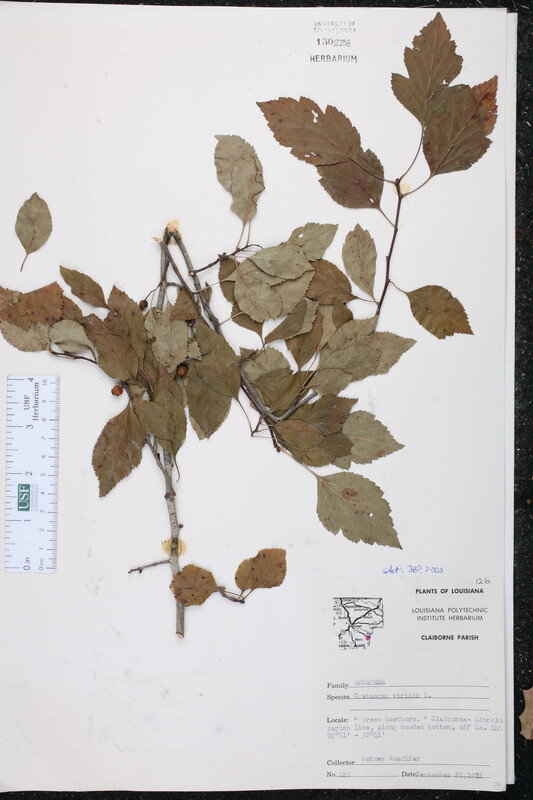 BASIONYM: Crataegus viridis Linnaeus 1753. Mespilus viridis Mespilus viridis (Linnaeus) Sweet, Hort. Brit. 134. 1826. 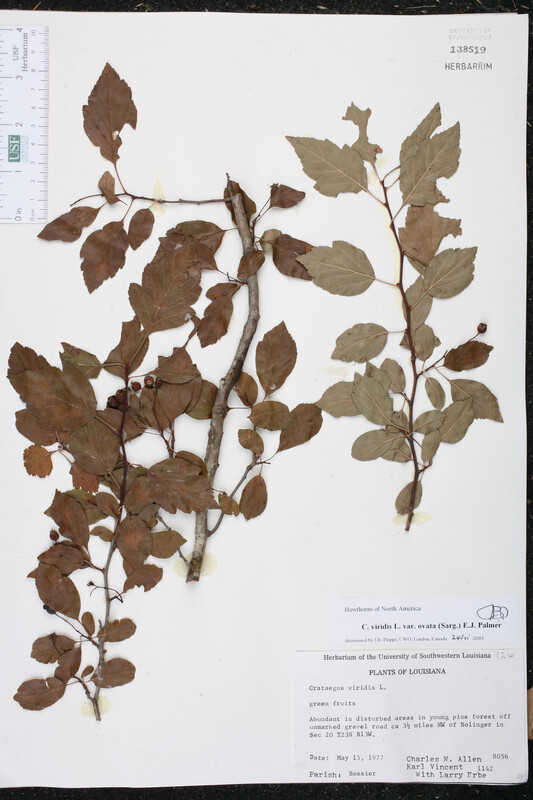 BASIONYM: Crataegus viridis Linnaeus 1753. 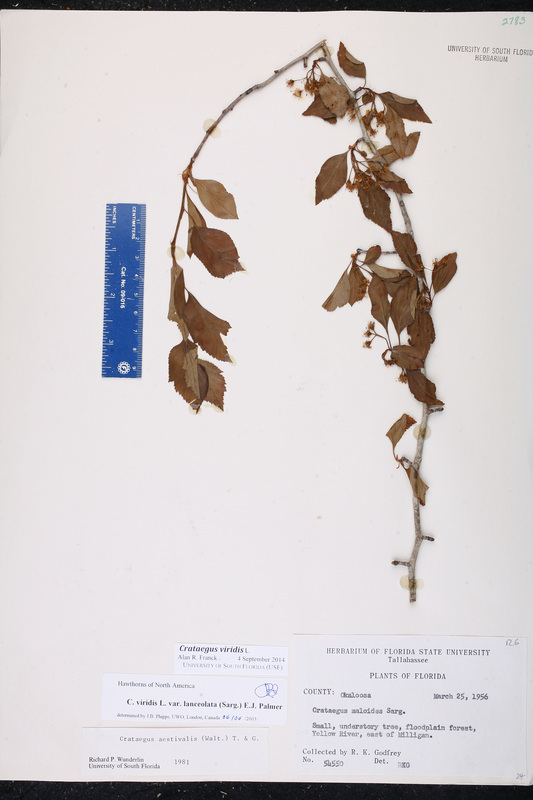 Phaenopyrum viride Phaenopyrum viride (Linnaeus) M. Roemer, Fam. Nat. Syn. Monogr. 3: 156. 1847. 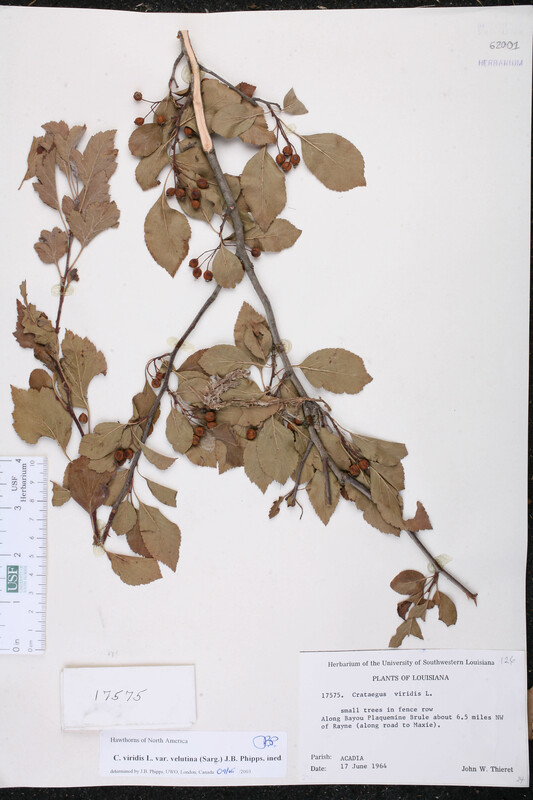 BASIONYM: Crataegus viridis Linnaeus 1753. Crataegus abbreviata Crataegus abbreviata Sargent, J. Arnold Arbor. 3: 187. 1923. TYPE: TEXAS: Brazos Co.: On the Brazos River, near Brazoria, 5 Oct 1914, Palmer 6734 (holotype: A?). 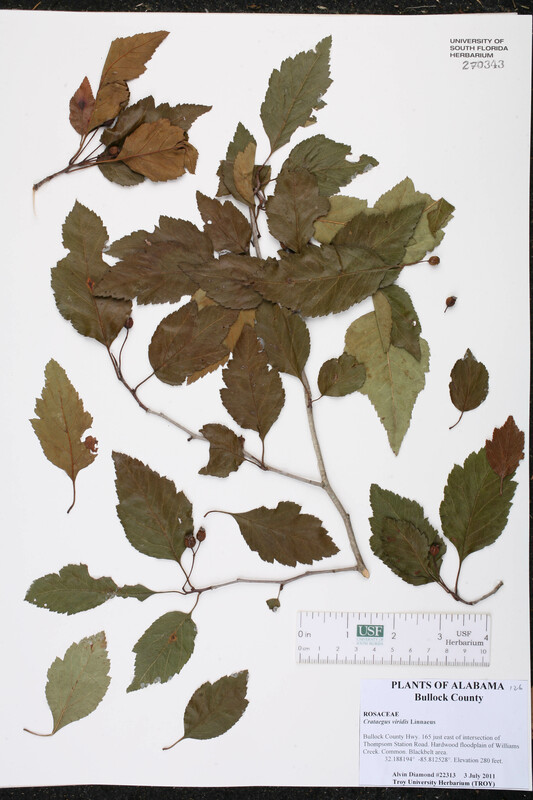 Crataegus amicalis Crataegus amicalis Sargent, Trees & Shrubs 2: 238. 1913. TYPE: ARKANSAS: Hempstead Co.: Near Fulton, 24 Apr 1902, Bush 1420 (holotype: A?). 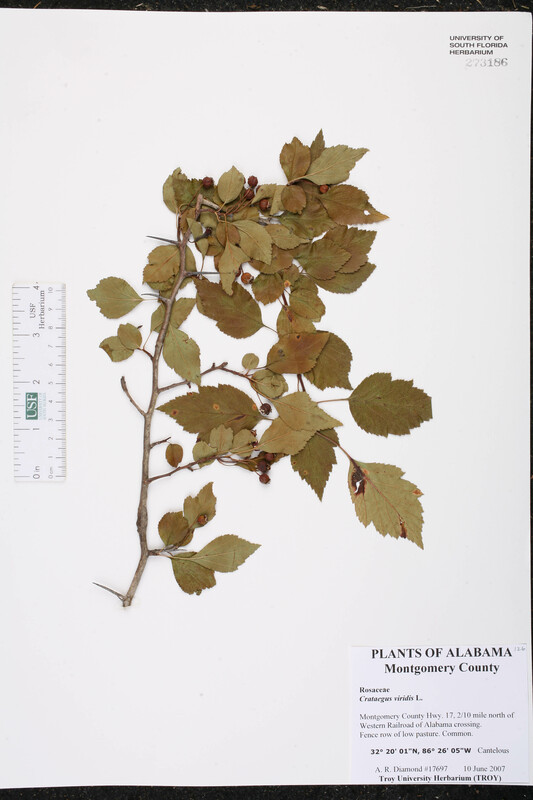 Crataegus atrorubens Crataegus atrorubens Ashe, J. Elisha Mitchell Sci. Soc. 16: 78. 1900. TYPE: MISSOURI: St. Louis Co.: Without locality, 1886, Eggert s.n. [fruiting portion] (lectotype: A). Lectotypified by J. B. Phipps et al., Harvard Pap. Bot. 11: 183. 2007. 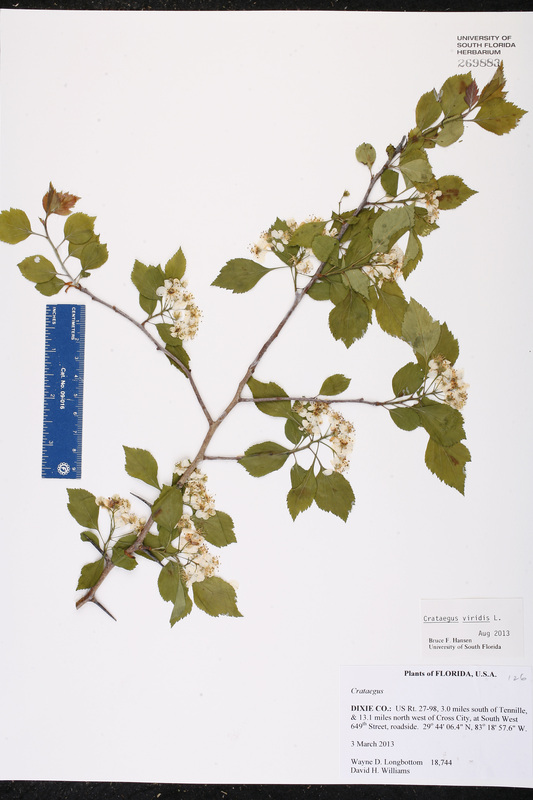 Crataegus enucleata Crataegus enucleata Sargent, Trees & Shrubs 2: 239. 1913. TYPE: ARKANSAS: Hempstead Co.: Near Fulton, 18 Apr 1901, Bush & Sargent 14 (holotype: A?). 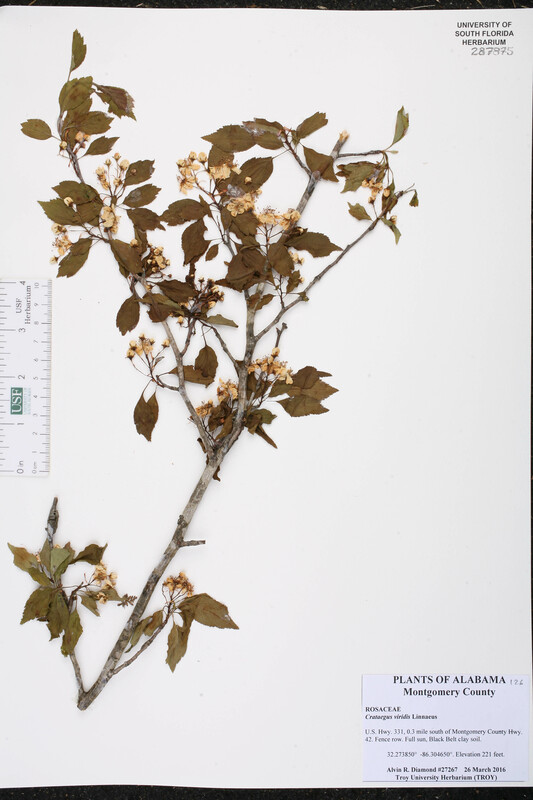 Crataegus glabriuscula Crataegus glabriuscula Sargent, Bot. Gaz. 31: 235. 1901. TYPE: TEXAS: Dallas Co.: Bottomlands of the Trinity River, Dallas, 15 Apr 1900, Bush 493 (lectotype: A; isolectotype: A). Lectotypified by J. B. Phipps, Novon 16: 3886. 2006. 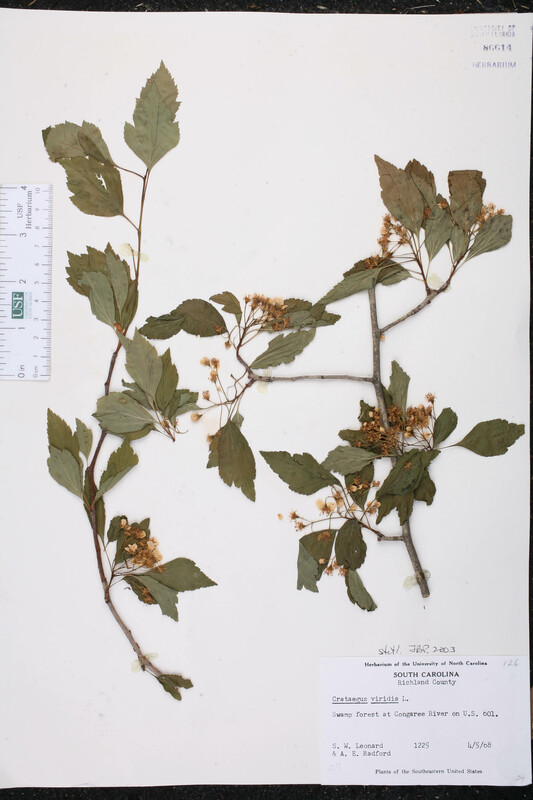 Crataegus lutensis Crataegus lutensis Sargent, Rep. (Annual) Missouri Bot. Gard. 22: 75. 1912. TYPE: MISSOURI: Newton Co.: Shoal Creek, Reading's Mill, 8 May 1909, Palmer 37 (lectotype: A; isolectotypes: A, MO). Lectotypified by J. B. Phipps, Harvard Pap. Bot. 11: 188. 2007. 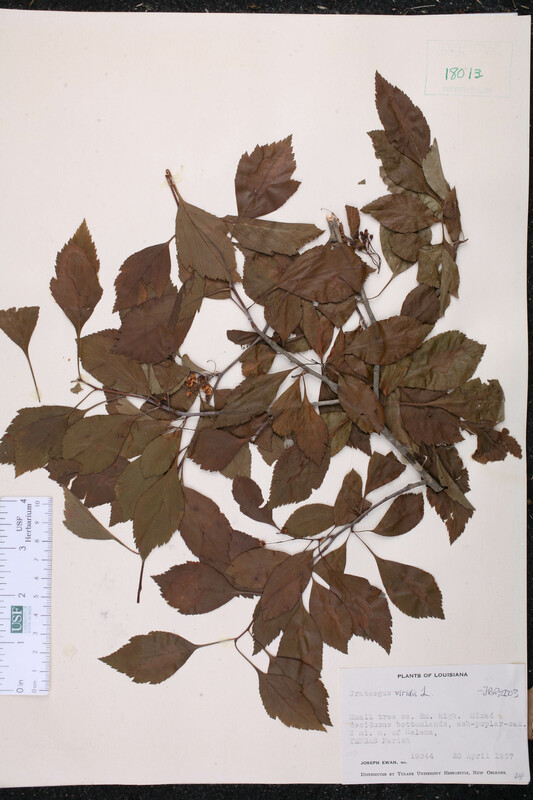 Crataegus micrantha Crataegus micrantha Sargent, Proc. Acad. Nat. Sci. Philadelphia 57: 658. 1905. TYPE: PENNSYLVANIA: Bucks Co.: Near Sellersville, May & Sep 1903, Fretz 183 (holotype: A?). Crataegus ovata Crataegus ovata Sargent, Man. Trees 402, f. 321. 1905. TYPE: MISSOURI: St. Louis Co.: Desperes River, St. Louis, 21 Oct 1901, Kellogg s.n. (lectotype: A; isolectotype: MO). Lectotypified by J. P. Phipps et al., Harvard Pap. Bot. 11: 190. 2007. 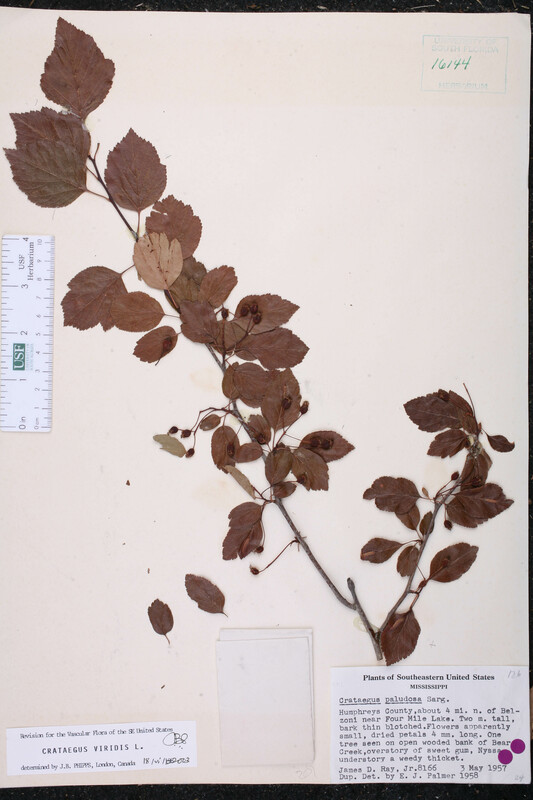 Crataegus velutina Crataegus velutina Sargent, Trees & Shrubs 2: 238. 1913. TYPE: ARKANSAS: Hempstead Co.: Near Fulton, 8 Nov 1905, Bush 10C (holotype: A?). Crataegus viridis var. 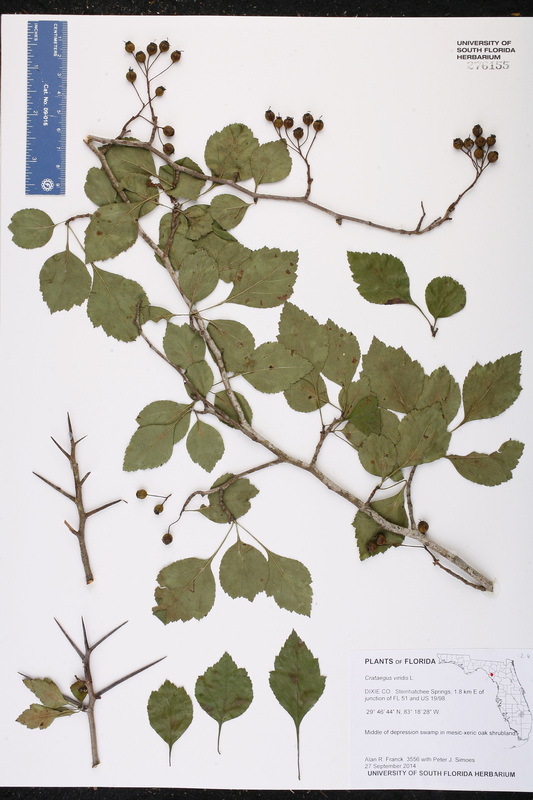 atrorubens Crataegus viridis Linnaeus, var. atrorubens (Ashe) E. J. Palmer, Ann. Missouri Bot. Gard. 22: 561. 1935. 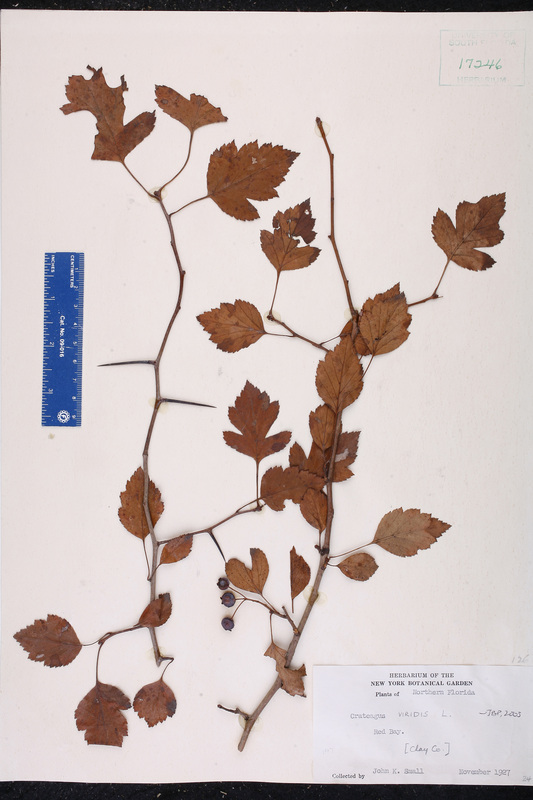 BASIONYM: Crataegus atrorubens Ashe 1900. 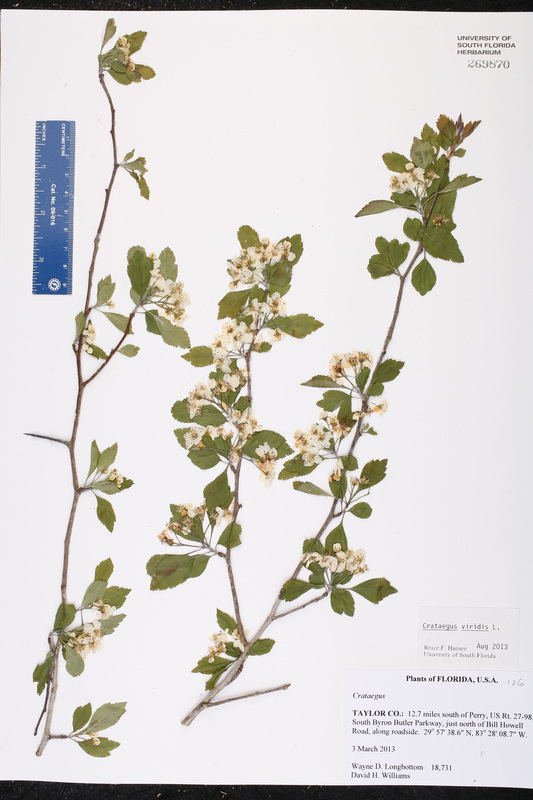 Crataegus viridis var. 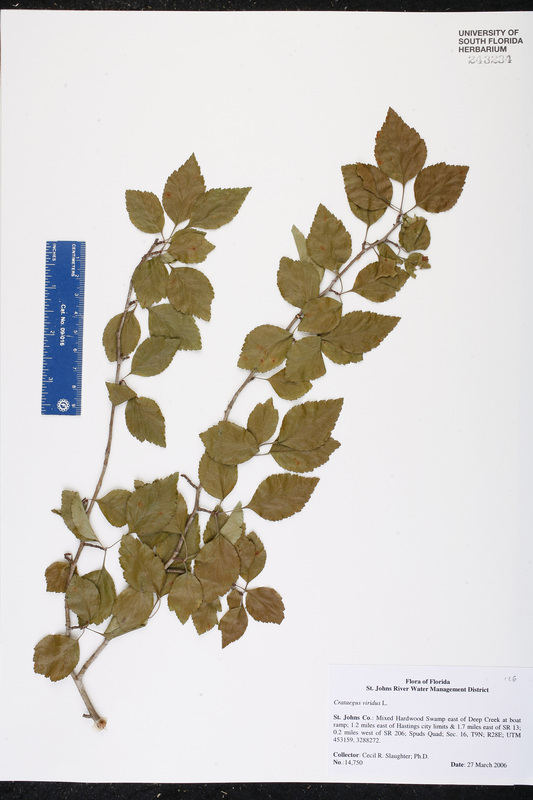 glabriuscula Crataegus viridis Linnaeus, var. glabriuscula (Sargent) J. B. Phipps, Novon 16: 386. 2006. 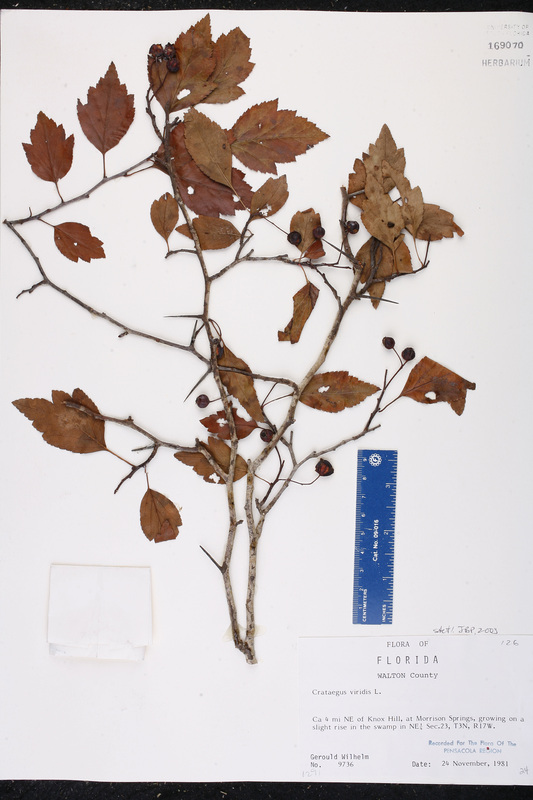 BASIONYM: Crataegus glabriuscula Sargent 1901. Crataegus viridis var. 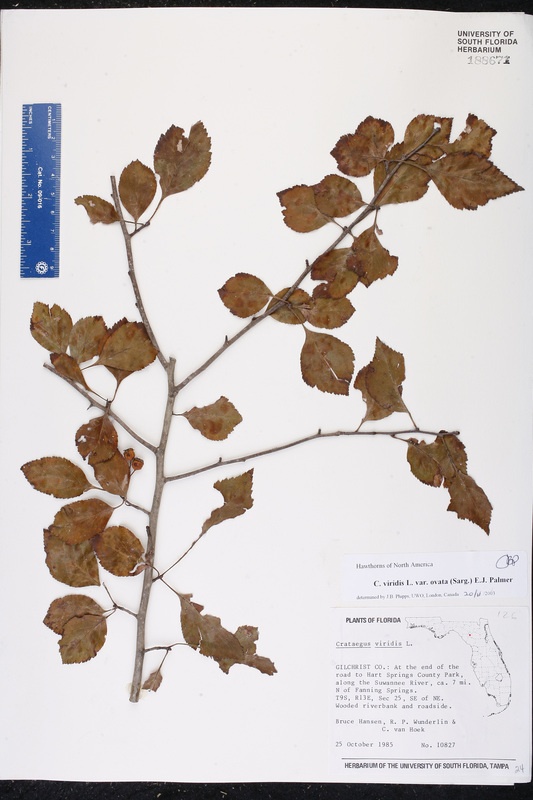 lutensis Crataegus viridis Linnaeus, var. lutensis (Sargent) E. J. Palmer, Ann. Missouri Bot. Gard. 22: 561. 1935. 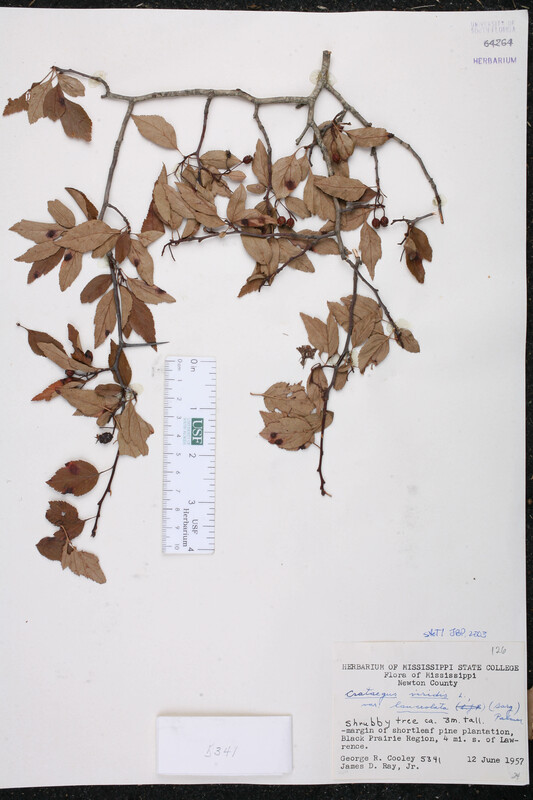 BASIONYM: Crataegus lutensis Sargent 1912. Crataegus viridis var. 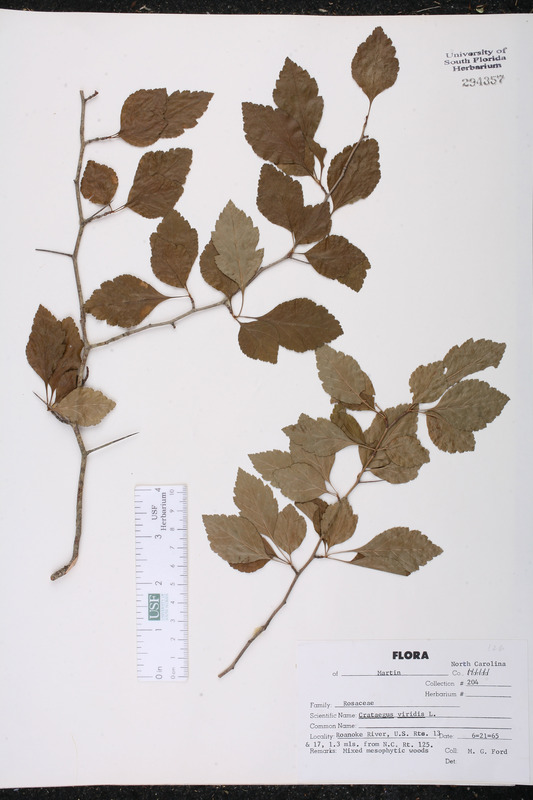 ovata Crataegus viridis Linnaeus, var. ovata (Sargent) E. J. Palmer, Ann. Missouri Bot. Gard. 22: 561. 1935. 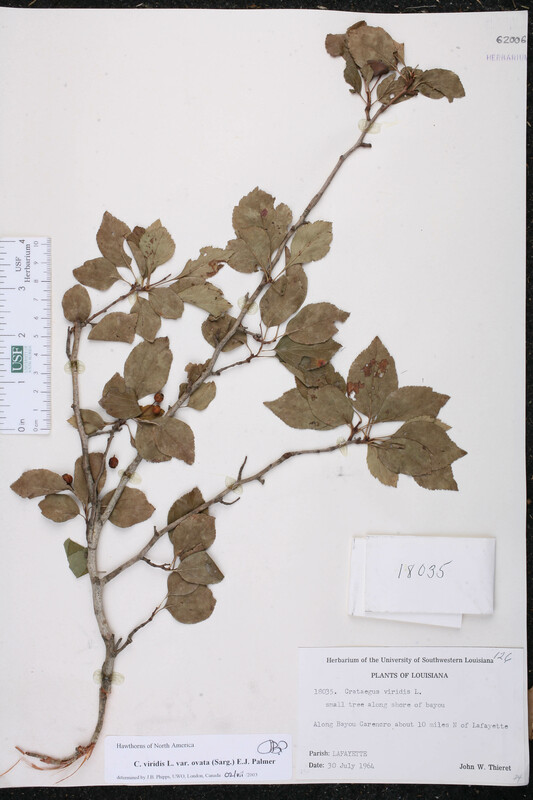 BASIONYM: Crataegus ovata Sargent 1905. Crataegus viridis var. 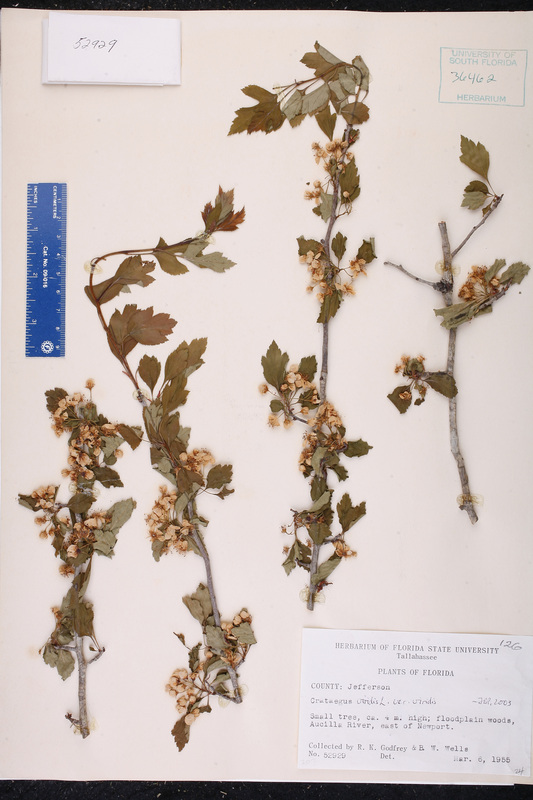 velutina Crataegus viridis Linnaeus, var. velutina (Sargent) J. B. Phipps, J. Bot. Res. Inst. Texas 1: 1009. 2007. 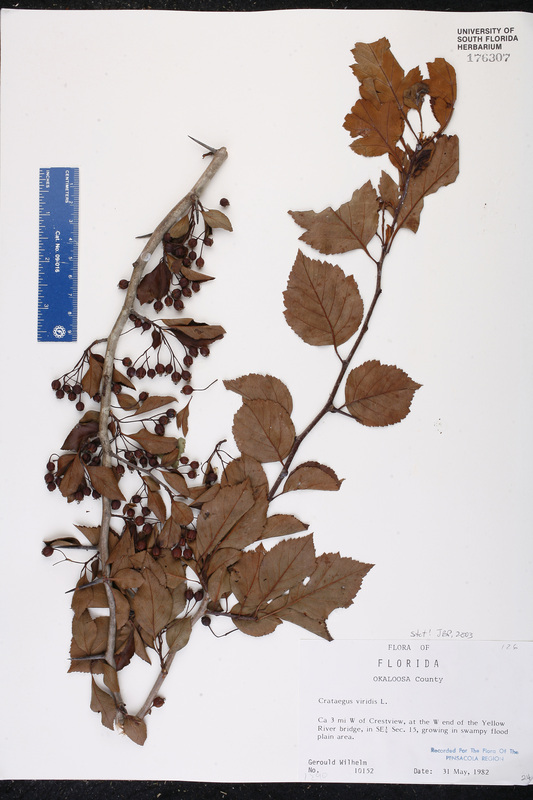 BASIONYM: Crataegus velutina Sargent 1913. USA Florida Clay Co. Nov 1927 J. K. Small s.n. USA Louisiana Claiborne Par. 21 Sep 1971 R. Roadifer 125 "Green Hawthorn." USA Alabama Montgomery Co. 10 Jun 2007 A. R. Diamond 17397 Common. USA Alabama Bullock Co. 03 Jul 2011 A. R. Diamond 22313 Common. USA Louisiana Claiborne Par. 08 Oct 1974 B. Corbin 74 "Hawthorne." USA South Carolina Berkeley Co. 16 Jun 1951 Elbert Luther Little, Jr. 14330 "Green Hawthorn."